Together with the Good Shepherd Sisters (GSS) we decided in 2006 to help children of one the poorest population groups in Yangon: their parents are garbage collectors and cleaners at the General Hospital and street vendors in Latha Township. Most of them live in Dala Township on the Southern side of the Yangon River; some of them are homeless, spending the nights at the hospital or railway station compounds. After renovation of an old garage building at the GSS compound the Sisters started with a nursery and pre-school for 20 children on October 2, 2006. The children were between 3 and 6 years of age, 90% of the children were from Buddhist and Hindu families, some were Christians, some Muslims. Three trained nursery teachers looked after the children. In addition to the normal nursery services we provide food and clothing to the children. The nursery program is complemented by regular two-weekly meetings with the parents to make them aware of basic hygiene and health issues and to help them with the education of their children. After most of Dala had been devastated by Cyclone Nargis in 2008 the Sisters were overrun by new applications to join the Downtown nursery which is free and provides food and clothing for the children. With the support of the Episcopalian Parish of St. Luke in the Field in New York we doubled the capacity of the nursery by a new extension building allowing us to accept 72 children between 3 and 6 years. Four licensed nursery teachers and a helper looked after the children. As the children are from poor and disadvantaged families, they rarely have enough food at home. Hence, our full-time cook provides free food at the daycare center. In 2009, we started to charge a small nominal monthly fee of US$ 0.50 per child to incentivize and stabilize the daily attendance of the children. Only parents who can afford this modest fee have to pay it. The monthly fee came with our promise that we will support the parents to register their children at the age of 6 at a government preschool (private schools were strictly prohibited in Myanmar, a rule which was gradually relaxed from 2014 onwards). The school directors of the more prestigious primary schools used to ask a registration fee of up to US$ 400 per child as a “cash present”. 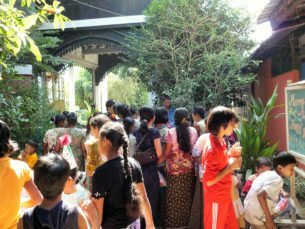 After 10 years of operation we closed the kindergarten for socially disadvantaged children in Yangon. Over the last years the availability of nurseries and preschools in our Yangon Downtown neighborhood has increased significantly. When we started our kindergarten in 2006, the nursery at the Good Shepherd Sister had been the only free-of-charge kindergarten in Downtown area. 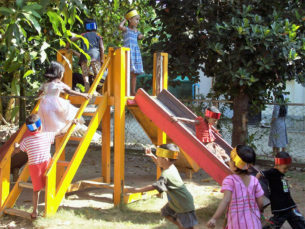 With Myanmar civilian government more NGOs and charities offer affordable and good child care services.